There are actually quite a few Lake Tahoe newspapers. Some even have web sites. While Reno and Carson City both have full featured daily newspapers, the need for several of the towns on the Lake Tahoe shoreline to have their own community newspapers is clear. Local events that might not be quite significant enough to warrant space in a big city paper, or community happenings of little interest beyond, say, Tahoe City, are always going to be in need of outlets. These days, "newspapers" are as likely to be on-line as hurled at your door by a teenager on a bicycle. (O.K., these days it's probably an adult with a van who neatly folds the paper and carefully places it in a waterproof plastic bag before again placing it gently on your welcome mat.) Hence, each "paper" discussed below has a greater or lesser on-line presence. Some are dropped off in stacks at local coffee shops; some are delivered to your doorstep if you live in the right area; but all are on-line. Local radio stations are also on-line, but that's a different article. 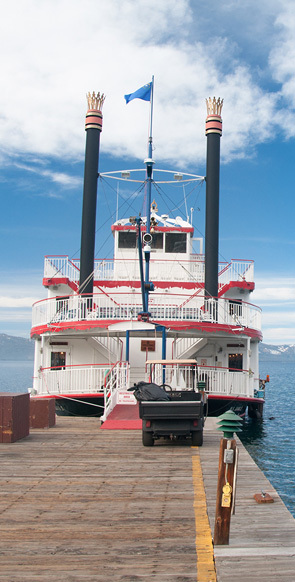 The Tahoe Mountain News (http://www.tahoemountainnews.net) is published once a month and covers news and events of Lake Tahoe's South Shore. The North Lake Tahoe Bonanza (http://www.tahoebonanza.com) is published three days a week and delivered to homes and businesses in the Incline Village and Crystal Bay areas only. It's been in circulation since 1970. The Sierra Sun (http://www.sierrasun.com) is a Truckee newspaper with new articles appearing on its web site daily and both email/website and home delivery. While reporting reaches as far afield as Reno, the majority of the articles and advertising appears to be centered on the town of Truckee and nearby communities. It's a sister publication to Tahoe World (http://www.tahoe-world.com) that is based in Tahoe City. The Tahoe Daily Tribune (http://www.tahoedailytribune.com) focuses on South Lake Tahoe and the South Shore primarily. All of these publications, with the exception of the Tahoe Mountain News, are affiliated with Swift Newspapers, Inc., out of Reno, Nevada. All have local publishers and reporters intimately familiar with their own neighborhoods. Much of the "news" in these papers has to do with local elementary and high school activities and sports, community events, car accidents, and so forth. However, real estate, environmental, and local governmental issues and happenings are also covered and generate considerable commentary by the local citizenry. So if you want to know what's going on in the local community you are visiting, check out some of the local "papers" and especially reader feedback. This is an especially good idea if you're thinking about buying real estate in the Lake Tahoe region.